One of Central Otago's most admired high country stations, bounded by Lake Wanaka and Mt Aspiring National Park and with a storied history, is for sale. Mike Direen of PGG Wrightson Real Estate, Alexandra, is marketing 12,770 hectare Mt Albert Station, Makarora, which he says is one of the high country's finest, combining excellent productivity with breathtaking scenery. A mix of mainly freehold river flats and pastoral lease high country, this is an outstanding property that will be a life-defining purchase for its new owner. An opportunity to own such a distinctive and archetypal piece of New Zealand arises extremely rarely, and is an aspiration that will appeal strongly to many people. A substantial farming operation in a pristine alpine environment with significant lake and river frontages, it offers the classic appeal of the best of the high country, combining scenic splendour with superior productivity, and complemented by recreational opportunity limited only by the imagination. Wintering 6,500 crossbred sheep and over 1,000 cattle, the station also finishes a considerable quantity of trading stock through the summer, mainly cattle, which can take the property up to over 20,000 stock units during this period. With the Makarora and Wilkin Rivers flowing through it, Mt Albert Station's aesthetic qualities are unsurpassed. This area is the entranceway to the natural beauty of the Mt Aspiring National Park, which is a World Heritage Area. Many outdoor enthusiasts utilise the scenic flights and jet boat trips from Makarora to access the boundless wilderness on the property's doorstep, he said. Located at the head of Lake Wanaka on the main southern tourist route between Wanaka and Haast, Mt Albert Station is 50 kilometres west of Lake Hawea, 64 kilometres northeast of Wanaka and 124 kilometres northeast of Queenstown International Airport, which Mike Direen says presents numerous options for a new owner to enter the tourism industry. With the rugged beauty of the mountains and rivers, encompassing glaciers, mountain lakes, hanging valleys and vast rainforests, jet boating and flying have long and successful commercial histories in the area. For example, one of New Zealand's best wilderness adventures is the Siberia Experience, combining a flight, a bush walk and a jet boat journey down the Wilkin River along the property?s boundary. New owners of Mt Albert Station will not be short of inspiration to create similarly thriving tourism and recreational ventures, he said. Within the property, approximately 813 hectares is freehold, which is mainly the river flats. Mike Direen says these comprise the property's productive engine room. Historically, one of Mt Albert Station's greatest features is the beautiful stretch of river flats up the Wilkin Valley, where deer once flocked in their hundreds in the spring. The Station's flats soak up an average of 2400 millimetres of rainfall per annum, while over 3000 millimetres falls in the higher country, he said. Mt Albert Station has a full range of farm buildings including a modern three-bedroom home, a five-bedroom homestead, two four-stand woolsheds, covered yards, two sets of cattle yards, five sets of sheep yards, two musterers' huts and three airstrips. It also includes 120 hectares fenced for deer.? Maori inhabited Makarora Valley until 1836, at which time it was covered in cabbage trees and flax and flanked by beech-lined mountains. 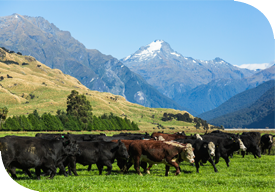 Initially leased in 1861 in conjunction with Makarora Station, in 1995, Mt Albert Station surrendered the grazing licences to the upper Wilkin Valley, Jumbo-land and Siberia, in exchange for 250 hectares of Makarora flats. In its present ownership since 2001, the current owners have added approximately 650 hectares of Makarora flats to the property, substantially developed and subdivided into over 100 paddocks, with modern improvements. Don Sparks, tel 03 440 2387 or 027 435 6499?